So, before I reveal the latest Sable photos, I want to talk about fundraising. 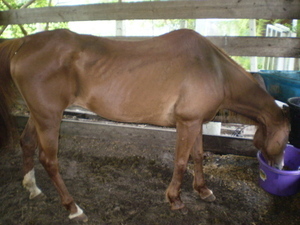 I want to thank everyone from Dreamhorse and Let It All Hang Out for getting the fundraiser ball rolling. I want to most especially thank Kathy, Renae and Ladonna (my new friends!) These ladies have been dedicated to Sable through their own life issues and I REALLY appreciate it! Thanks to Jessica and Christine for getting the rescue ball rolling! Thank you to Margo-- for your support both financial and emotional! Now, I have to thank the non horse and non forum people who saw Sable's photos and flat out insisted on helping... All my "yarn and fiber friends", you guys ROCK!!! I know we have raised a good amount of money at Knitwitz, but I haven't managed to get over there to check and see how much. This past weekend, the Jax Ravelers had a meet up and we raised.....**drum roll please** ONE HUNDRED AND TWENTY DOLLARS in one day. 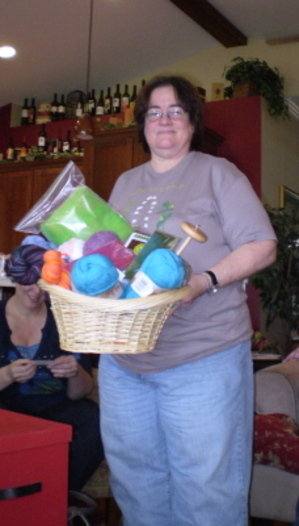 We held a raffle (thank you, Chris/Sugarbee Studios, Ruthee, and Susan from A Stitch In Time) and the winner received a lovely basket. Now if I knew the winners name, that would make this post complete, BUT here is a photo of our lovely winner and her prize basket. 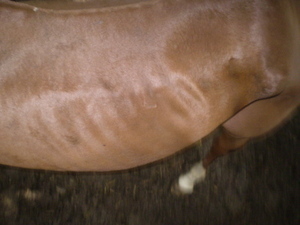 She's looking better, and with less ribcage showing than the last post.